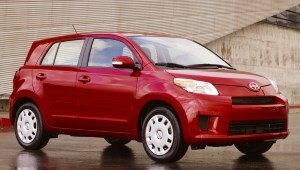 Scion XD. 2007–14 (prod. n/a). 5-door sedan. F/F, 1797 cm³ (I4 DOHC). Second-generation Ist, now called XD, rather than XA, for North America. Different grille from the home-market Ist, and a 1·8 instead, giving the XD decent performance for the class. Well equipped but dynamically uncompetitive. Sales dwindled to below 10,000 and the XD was cancelled after the 2014 model year.